Welcome to Char Dham Yatra tour!You will be greeted by Atlas Travel representativeon arrival. Board the Coach (10:00 PM) and drive to Rishikesh. Overnight Journey. Morning arrival at Rishikesh, after fresh up &breakfast proceed for Sightseeing which coversShivananda Ashram, Ram Jhoola, Swarg Ashram, Geeta Ashram, LaxmanJhoola. After lunch proceed to Barkot, via Dehradun Μssoorie. En-route visit Kempty Fall and enjoy the beauty of Himalayas, (route may be change as per road condition & traffic) later drive straight to Barkot for night stay. Early morning drive to Jankichatti, trek starts from here to Yamunotri (6kms). On arrival leave the vehicle and start to ascend on trek route either by walk or pony/doli (at own cost). On arrival at Yamunotri purchase Prasad form local small shops, then proceed to holy dip in natural hot water spring or in river Yamuna (icy cold water). One can cook rice in “Surya Kund” (hot water spring), dipping in a muslin cloth and take cooked rice home as "Prasadam". Pooja can be offered to mythological “DivyaShila”. Take blessings of Mata Yamuna and trek down to Jankichatti. Later drive back to Barkot for night stay. Morningafter breakfastdepart to Uttarkashi, en-route visit PrakateswarMahadev (Shiv Cave) &famous Kashi Vishwanath temple at Uttarkashi.Later drive to hotel, Overnight stay at hotel. Morning proceed to Gangotri (3048mts), en-route enjoy the drive parallel to River Bhagirathi and the most magnificent view of the Himalayas. On arrival at Gangotri have a holy dip in river Bhagirathi (icy cold water). Perform Pooja and Hindu rites at the bank of river. Then proceed for darshanof Mata Ganga, Lord Shiva, Hanuman,Vinayka and BhagirathMaharaj (all temples are within compound area)have blessings and return back to parking area board the vehicle & drive back to Uttarkashi. Overnight stay at Uttarkashi. Early morning drive toSitapur, on arrival check into hotel, Overnight stay at hotel. Early morning drop to Sonprayag(for trek route)trek starts from here to Kedarnath.Start to ascend on trek route either by walk or pony/doli (at own cost). Helicopter service is also available for Kedarnath, so one can take helicopter to Kedarnath(at own cost). Tour members should carry personal medicines, heavy woolen, toiletries and clothes.After performing Pooja &Darshan of Shri Kedarnathji return to Sitapur. Overnight stay at Hotel. Morning at leisure, today depart in the afternoon (around 12:00hrs noon) to Pipalkoti, on arrival check into hotel. Overnight stay at hotel. Morning drive to Badrinathen-route visit Joshimath (NarshimhaTemple) & Vishnu Prayaglater drive to Badrinath& visit Mana Village(India’s last village towards Indo-Tibetan border)which includes Vyasa Gufa, Ganesh Gufa, Bhimpul, Saraswati river etc. thereafter check into hotel & free to explore the Badri Valley & visit Badrinathtemple after a holy dip in Taptkund. Proceedthrough colorful entrance of the temple have Darshan of Badrivishal along with Ganesh, Kubera, Garuda, Narada, Udhhav, Nar & Narayan. Also see another small temples inside the temple compound i.e. Laxmimata, Nar-Narayana, Hanuman, Ghantakarn and Kaamdhenu. One can get ‘Charnamirt’(abhishekamjal) inside compound. Morning afterbreakfast &Darshan of Badrivishaltransfer to Srinagar, en-route visit Karanprayag, Nandprayag, Rudraprayag&DhariDevi temple.On arrival check in at hotel, overnight stay at hotel. Morning after breakfastdrive to Haridwar, en-route visit Devprayag the confluence of Alaknanda and Bhagirathi. 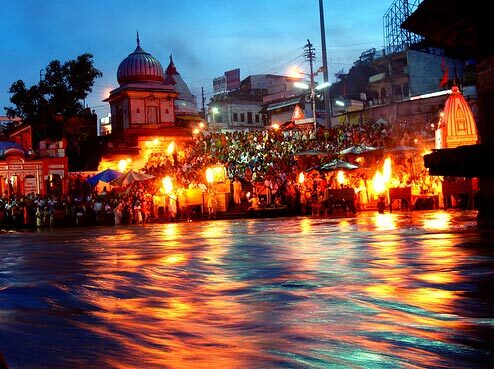 Here onwards downstream river is called Ganges, later transfer to Haridwar, on arrival proceed to perform ritualistic bathing on the banks of pious river Ganges and join the enchanting evening Aarti at Har-ki-Pauri. 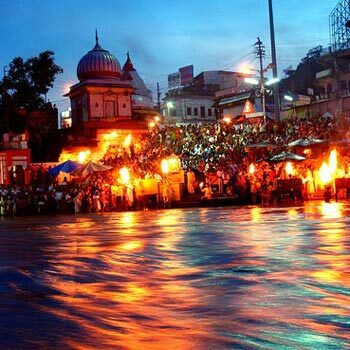 Brahma Kund, the spot where the Amrit (nectar) spilled out of the pitcher, is located at HarkiPauri and is considered to be prime ghat of Haridwar.if time permit one can visit Manasa Devi temple.After dinner, board the Coach to Delhi, overnight journey. Morning arrival at Delhi (05:00 AM).Heretour ends here with happy memories to be cherished forever.